In the Marketing Rockstar’s Guide to Marketo, I discuss how to test a nurturing program by laboriously cloning the Program, changing the Wait Step times to 2 minutes, and then running a whole series of tests. This work is absolutely necessary to ensure your nurturing program is running as intended. You wouldn’t want to suddenly send 6 emails in 6 seconds, would you? 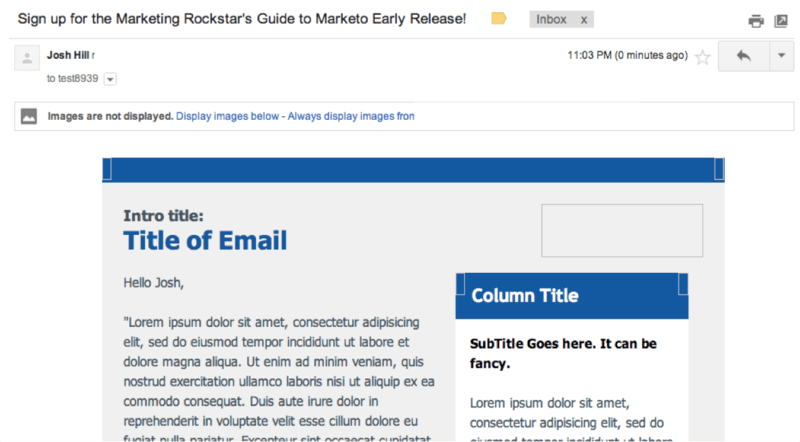 Or set the lead to MQL after one email click? Right, so you need to take the time to test everything. The good news is you can skip some of the tedious work with Engagement Programs. Since the system obviates the need for complicated Traffic Cops, the need to test various transitions is largely gone. 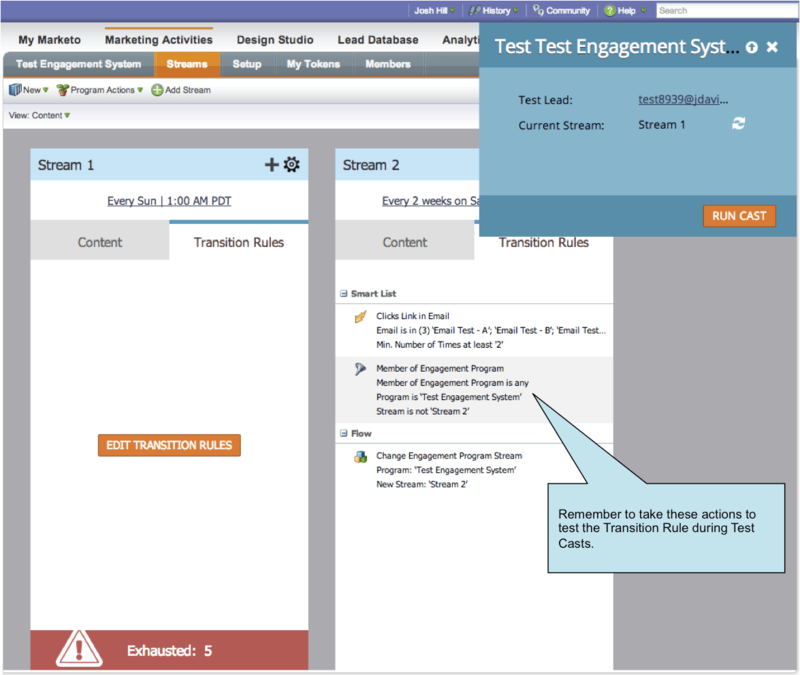 The new Test Stream function for Engagement Programs takes a small step out of the testing process. Instead of building a “loading workflow” to add some test leads, you can do this straight from the Engagement. The caveat is this is a “live test” that runs the entire length. I agree this saves a step or two on testing an Engagement, however, it doesn’t let you test this in an hour. 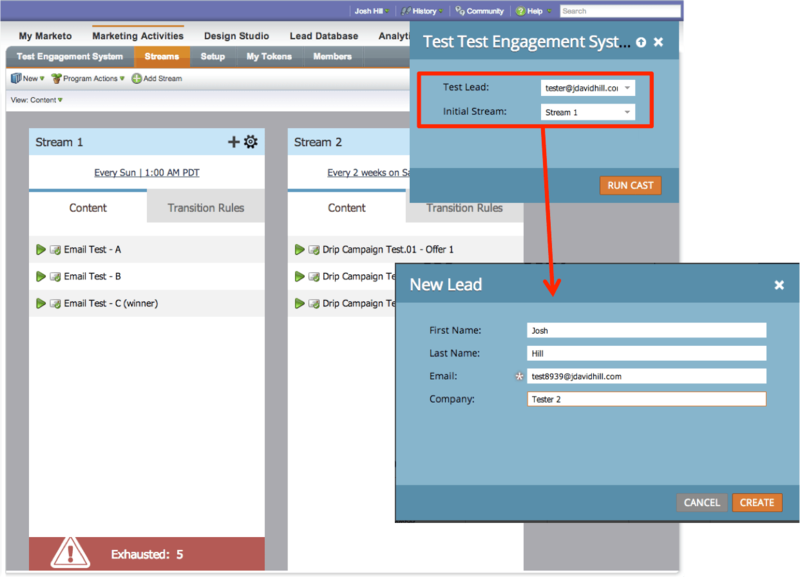 As Cheryl Chavez at Marketo pointed out, this is primarily a tool to help you test a live Engagement. Cadences are Still the Same: Your Cadence will still be the same as in the live version…because it is still a live Engagement. If you plan to test the Stream, I recommend changing the Cadence to Every 1 week each day to speed it up. Unfortunately, this won’t allow you to test the system in 10 minutes. Test Leads: if a lead was previously Exhausted or a Member, they will not get the Test Cast. Test Actions: if you have two or more Streams, you need to take the specific actions to force the Transition Rule to trigger. This is fine, but you need to remember this. And you won’t get the chance to do this until the Cast sends you enough emails to take action on. This step is the same as what I previously wrote about in the Guide. This is also true if you are testing a sister campaign that would pull the Lead out and set it to MQL. Step 2: select Test Stream from the Program Menu. Step 3: select (or create) a Test Lead to use from the pop up. Note the cool Cobalt Interface. Step 4: receive first Cast. Step 5: take relevant actions to activate any Transition Rules (or other goals). Step 6: Review logs by going to Engagement Program > Members. Step 7: Click on Test Lead (the Lead will look like a normal Member). Step 8: review log. Click on the “Deploy Test” campaign name to unlock the secret Program. Step 9: Look at the Deploy Test Program secret Results tab. That’s pretty much all there is to Testing Streams in Engagement Programs. If you discover anything else, let us know below! And remember to sign up for future updates – there’s a free gift involved that’s sure to help you. Hey Josh …The whole point of using the Test Stream feature is to not have to change the stream cadence. Every time you click the “run cast” it mimicks a cast running. This is important if you want to test a stream that is already “Live”. Furthermore, you are testing with a live lead (most likely yourself) and that lead will follow all the rules, including exhaustion. Yes I understand that, but I read it as “Testing” which is different than just a faster way to load a test lead and have it run through. I understand that Engagements leaves less to require testing, but what if you want to run the Cast and test it in an hour instead of 5 weeks? Sorry that point didn’t make it through on the post. I’m going to clarify some of this.